The skin or epidermis is the external protective layer of the integumentary system. Skin provides protection against injury from the external environment. Direct pressure and friction forces can create thickening of the skin eventually leading to the development of a callus. Callus is a protective response of the skin to prevent injury. Thickening of the callus over time can lead to the development of pain. The excess callus on the foot can cause pain related to an increase in pressure on the underlying sensory nerves of the skin. Callus on the foot can occur on the weight bearing and non weight bearing surfaces of the foot. The weight bearing surface of the foot would be generally considered the bottom of the foot with the non weight bearing surfaces the top of the foot. Callus on the weight bearing surface of the foot occurs related to pressure and friction forces that develop between the bottom surface of the foot and the ground while callus on the non weight bearing surface of the foot generally occurs related to friction pressures between the skin and the shoe surface. Callus on the bottom of the foot is generally seen at the heel or the ball of the foot. Pressure and friction forces are experienced through the three phases of walking including heel contact, midstance and propulsion. Pressure and friction forces are different through all three phases of the walking cycle. Generally, callus occurs more frequently at the heel and the ball of the foot with very little callus occurring in the arch region. Callus at the heel region generally occurs in the periphery of the heel related to friction forces that occur between the motion of the fatty tissue on the sides of the heel and the ground. Callus to the ball of the foot can occur at each of the five metatarsal contact points. Each of the five metatarsal can take up different pressures and friction forces during walking with callus occurring at the metatarsal that experiences the greatest direct weight bearing and friction forces. Callus formation on the bottom of the foot can be diffuse or localized. Diffuse callus like the development of callus in the palm of your hand typically does not cause pain. Localized callus or keratoma can be quite painful related to the direct pressure placed on the underlying sensory nerves. These keratomas can occur within sweat glands on the bottom of the foot called porokeratosis. 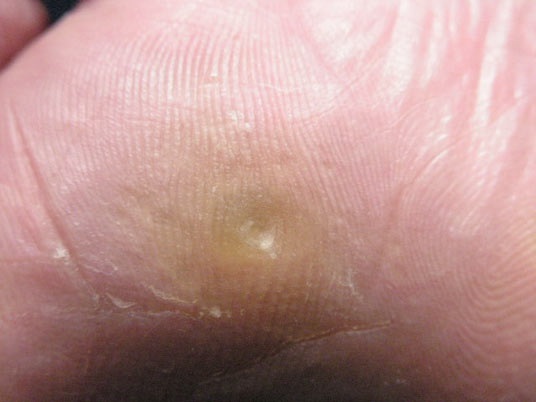 Porokeratosis and keratoma are often misdiagnosed as plantar’s warts because of their localized appearance. The pain associated with callus can be relieved by reducing pressure at the callus site by either thinning the callos or by placing more pressure around the callus. 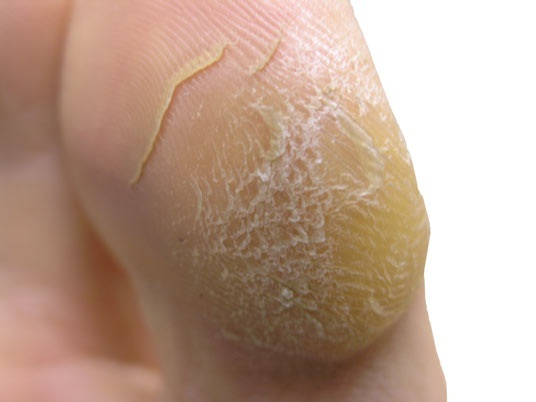 Reducing the thickness of the callus can be performed by thinning the callus with the use of over the counter debridement agents like pumice stones as well as the medically guided use of topical corn or callus removal agents. The following pictures represent callus occurring between the fourth and the fifth digits. The pain related to the callus can be relieved by reducing the thickness of the callus in conjunction with padding that is used to help separate the toes. Pressure reduction is the main treatment to reduce the pain as well as recurrence of callus on the bottom of the foot. Store purchased or custom orthotics with an appropriately cushioned shoe can be used to reduce the pressure at the callus site. By reducing the pressure with an orthotic pain as well as the callus build up will resolve. Orthotics not only reduce direct pressure on the callus region but also decreases the friction forces that occur during the various phases of the gait cycle. Additional padding on the store purchased or custom orthotics additionally reduce pressure to help relieve pain. Callus occurring on the non-weight-bearing portion of the foot generally occur related to contact friction that occurs between the skin and the surface of the shoe. The tops of the toes often develop callus or “corns” related to friction forces. These corns often occur related to preexisting deformity of the feet including at toes with flexion contractures called hammertoes. Shoe selection is critical in the reduction of pressure to all areas of the foot. Callus or corns that occur on the toes are generally improved with the selection of a shoe that provides adequate room in the toe box area of the front of the shoe. Women’s as well as men's slip-on shoes, including flats and loafers, tend to be narrower in the ball of the foot as compared to the heel region. The narrower fit in the ball of the foot can increase friction forces on the toes which can secondarily build up painful corns. Reducing the friction forces at the toes with the use of a shoe that is wider in the ball of the foot can help reduce the thickness of corns over time. The medically guided use of corn or callus removal agents, along with the use of pumice stones can also help in pain reduction. If deformities including hammertoes are present, surgical correction may be indicated if adequate shoe changes have not provided pain relief from the corn. The surgical correction of a hammertoe relieves pain by removing the underlying prominent bone which will secondarily reduce the friction forces occurring between the skin and the shoe surface. The location of the callus helps direct the type of care needed. Callus occurring on the bottom of the foot can often times be treated by pressure reduction with the use of an orthotic device as well as reducing the thickness of the callus tissue. Callus occurring on the top of the foot and the toes is generally treated with pressure reduction with the use of a well accommodating shoe which will reduce the friction forces occurring on the toes or elsewhere on the foot.